The quantity and tone of comments on Martin Kettle’s brave Guardian column titled 'Why we must talk about Britten’s boys' highlights the problem of the ownership of dead composers. It seems every Guardian reader believes they own Britten, or rather believes they own an idealised image of him, and heavens help anyone who challenges that image. In this discussion ‘ownership’ is a metaphor for the biases, agendas, conditioning, illusions, dualisms, allegiances and other emotional baggage that we all carry, and which are barriers to objective assessment. The ownership of dead composers is not confined to broadsheet readers. Radio stations claim ownership with marathon anniversary coverage, bloggers contend for ownership by championing favoured composers, authors assert ownership with biographies, and musicians make their own bids by specialising in a composer’s music. Others have commercial claims to ownership, including the estates of dead composers that benefit from royalties, the publishing houses that control their catalogues, and the foundations that fund performances of their music. All dead composers are the subject of complex and conflicting ownership claims, but Britten is one of the more extreme examples. The Britten-Pears Foundation and Faber Music have persuasive claims, the residents of Aldeburgh have a different kind of claim and many still view Humphrey Carpenter’s frank biography as reprehensible, while, as debate about Britten’s boys raged in the Guardian last week, another ownership contender tip-toed around the dead moose of the moment by tweeting the revelation of “cup cakes served @aldeburghmusic”. There is no doubt the estates, publishing houses and foundations that represent dead composers do invaluable work. And, similarly, every composer needs their loyal followers. But let's not forget there are also numerous examples in the arts world of well-meaning disciples seizing ownership, and in the process distorting a great creative legacy. Any outsider reading the comments on Martin Kettle’s Guardian column must inevitably conclude that classical music is not an art but a blood sport. Acceptance that nobody owns a dead composer would make classical music more tolerant, and, more importantly, would make it look less ridiculous to outsiders. 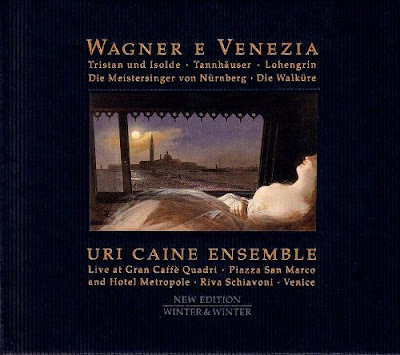 Uri Caine is a master at de-bunking the ownership myth with his irreverent takes on composers which include upcoming anniversary boy Wagner played by a six piece ensemble in a café in the Piazza San Marco, Venice, as seen above. It would be nice if Uri added Britten to his scalps in 2013, if only to see the reaction of the composer's many self-appointed owners. The problem with Kettle's article – pace its mention of your blog – is that it was merely there to 'grab audience ratings' (to quote you out of context). The Savile case is predicated on the systematic cover up of a litany of cases, which have been tardily registered. I don't see the evidence mounting up against Britten at all in the same way. Those who had admit to having 'sexual contact' with the composer were open about it, but didn't press charges. Surely had they suffered their loyalty would have already been dented enough to break the perceived Aldeburgh silence? If people were now to come forward with the same claims against Britten then I would see the link (though, as with Savile, where justice will derive is beyond me). More apposite, though less culturally beguiling, would be to posit links between Savile and Gary Glitter (as I read in a recent German newspaper). We can't go as far as Charles Rosen when he said of Schubert 'I do not care if he slept with men, women, or horses.' You cannot separate a composer's work from their life (for better or worse), but let's at least set decent parameters for the debate, as you had done in your original post. That said, I can't see how Carpenter or Bridcut's books/TV programmes tow any sort of party line, regardless of any perceived pressure put on them through Faber and Faber. The fact that Carpenter quotes extensively from Mackerras and other 'corpses' is only indicative of its balanced (if gossipy) approach. Will the new biography by Paul Kildea dodge the loyalty/truth bullet? Or will his former links with Aldeburgh and the Britten Pears Foundation put him out of your running too? With regard to the tweet about the cupcakes, I see that one tweeter in response suggested 'AH' stands for Albert Herring, and received 0 marks for that. I rather suspect it represents 'BBC Radio3 Publicity and Classical Music Television', for which 'AH' is a code, though what it stands for I have no idea. There's 'ownership' for you! I always enjoy Gavin Plumley's comments, but I must differ on this one. I fear that the point made originally by Pliable and taken up by Kettle has rather been lost, to my dismay. The point is, in a sense, not what Britten did, but what he did not. And not the truth of the matter, in biographies or elsewhere, but distortions thereof or outright fabrication for the sake of readership -- not in the Guardian, but in the gutter press, blogs with a focus on the salacious, twitter, FB or any other medium created for the benefit of the barely, if at all, informed. The point made and increasingly lost, I think, is that knowledgeable people in the classic music world can, by discussing the issue openly and frankly NOW and henceforth, do much to prevent the matter being grossly misrepresented with attendant accusations of it being covered up, as it was in the Savile case. That's the nexus. Further, just as Savile was sanctified in life, so has BB been in life and in death, though on what basis has long been a mystery to me. His brutal cutting of friends who in some cases had served him long and well was more than enough to put me off. But the fact that we know boys slept in his bed takes us to the point. We may accept on the basis of testimony that there was no sexual contact in that bed, but what we may anticipate from the Mirror or the Mail is something along the lines of a header reading, "Britten Slept with Children", and then we'll be off to the races. What both Bob and Kettle have suggested is that open discussion of this, in the context of Britten's life, as the anniversary approaches will do much to forestall both that and talk of a cover-up. Thanks for that Philip. Like you I have great respect for Gavin's views, but I thought his comment on this particular post was a good illustration of "the biases, agendas, conditioning, illusions, dualisms, allegiances and other emotional baggage that we all carry". Anyone still not convinced that classical music should be discussing the matter of Britten's boys "openly and frankly NOW and henceforth" should see On An Overgrown Path's traffic logs - and the traffic is not all coming from Martin Kettle's link by any means.